Air conditioning comes in handy during those hot summer days when ice cream instantly melts into a soup and regular soup just vapourizes. Lower the mercury with this Groupon. A technician cleans the entire length of the air vents via reverse air sweep and then power brushes the main duct lines in the basement, cleaning all the sides and corners with suction at the point of cleaning. This deal is a hot seller. Groupon has already sold over 1,000+ vouchers at the time of this post. Promotional value expires 90 days after purchase. Amount paid never expires. Valid only within service area – must call to confirm. If home was built before 1970, please call before purchasing. Purchasers urged to call ahead for commercial and home renovations. Not valid for commercial, rental units, home renovation projects ,or condos. $1.50 per kilometer after the initial 5 kilometers due upon arrival. 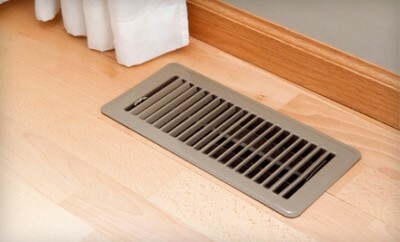 Extra $7 fee for each additional vent. Appointment required. Valid only within 5 km. of zip code R2N1R7. Limit 1 per person. May be repurchased every 30 days. Limit 1 per visit. 24-hour cancellation notice required. Merchant is solely responsible to purchasers for the care and quality of the advertised goods and services. One of modern man’s greatest accomplishments must be the ability to control the climate of our homes. The technicians from Razok’s Manitoba Heating & Cooling work to ensure their clients’ climate-control systems are running efficiently and haven’t been overtaken by a snowman trying to extend a very short winter. Techs will inspect HVAC systems, clear air ducts of debris and lost top hats, and even replace faulty systems for newer models.